Ole Gunnar Solskjaer has opened Manchester United's doors to Paul Scholes after he quit as Oldham manager just 31 days into the job. The 44-year-old signed an 18-month deal last month to take his first steps in management with his boyhood club. 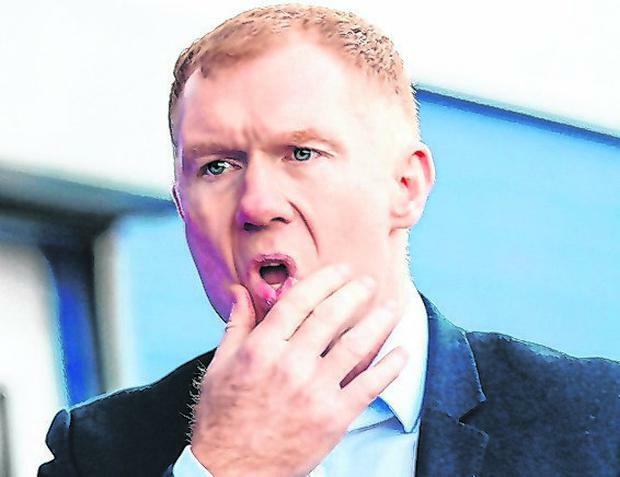 But things quickly went awry at Boundary Park and Scholes quit the League Two side on Thursday after one win in seven matches. The former midfield star left claiming it had become "clear that (he) would not be able to operate as intended and was led to believe prior to taking on the role". Those sentiments were shared with Solskjaer, who has invited former team-mate Scholes into the Aon Training Complex for a chat. Asked if he was surprised to see Scholes leave, Solskjaer responded with a laugh: "Were you? Well, he's probably got his reasons why he left. You've got to ask him (if he will go into management again). "He's invited here if he wants to come and have a little chat about it. I've texted with him of course and it didn't work out as he wanted, so that's just management." The subject of Scholes coming into the club was revisited later in the press conference. "He's been great so far and you see ex-players coming in and if they want to learn, if they want to stay for a few days, a week (they can)," he added. "I know when I was away that I would have loved to come in and maybe do some study visits, but I had work, so I didn't get the chance to do it." Scholes spent some time coaching at United after retiring for the first time in 2011, then worked during Ryan Giggs' interim period at the helm in 2014. Latics owner Abdallah Lemsagam was shocked to receive Scholes' resignation via text message. "I am disappointed by Paul's decision to resign and surprised by the reasons he has given in his statement," Lemsagam said in a statement. "Both myself and the staff at the club gave Paul all the support and autonomy that he asked for. I personally was always supportive of any decisions Paul made or consulted me on, reassuring him that he was the man in charge."